It may seem laughable to the cutting-edge technologists in Silicon Valley, but the biggest threat to the Valley’s beloved and revolutionary carmaker — Tesla — just might be doddering old General Motors (GM). Tesla, of course, is a media and stock-market darling. Against long odds, the upstart company headed by entrepreneur Elon Musk has created two gorgeous electric cars, the Roadster and Model S, that have seduced drivers with a suave blend of engineering, performance and novelty. While other upstarts, such as Fisker — and even some long-established carmakers, such as Saab — have failed during the past few years, Tesla (TSLA) has thrived. Its stock is up nearly 400% this year, prompting even Musk to say it seems overvalued. So it’s easy to dismiss GM’s claim that it plans to develop batteries that will be able to move a car 200 miles on one charge, at a cost of $30,000 or so — close to the range of the Model S, at less than half the cost. GM’s most prominent electric car, of course, is the Chevy Volt, which can travel about 35 miles on one charge, starts at $34,000, and is approximately as exciting as a minivan. GM launched the Volt in 2010 amid a huge hype campaign that ended up making the car seem like a failure. GM badly missed initial sales targets and has since resorted to discounting to keep Volts moving off the lot. It hardly helps that GM took a huge government bailout in 2009, leading critics to deride the Volt as a foolish government science experiment. GM can be a formidable competitor, however, when it funnels its resources into focused projects. And it has two big advantages over Tesla. The first is scale, which is vital to profitability in the car business. Since the costs of designing and manufacturing a given automobile are huge, it’s essential to be able to spread them across the largest possible sales base. Like other big automakers, GM can develop technology for one car that it uses in a dozen different models or more. Tesla’s tiny product lineup doesn’t allow for that, which is one reason it's lost money five years in a row, and only recently turned its first quarterly profit. GM also has proprietary battery technology that could turn out to be a game-changer if the automaker can manage to get costs down and range up. Unlike Tesla, which relies on off-the-shelf battery technology it harnesses in a unique way for automobiles, GM has been working to develop breakthrough batteries since it launched the doomed EV-1 project in the 1990s. It hasn’t quite succeeded, needless to say, but GM has the deep pockets and staying power to keep nursing the technology until it matures. Despite many duds in its past, GM also has the chops to build great cars, as just about any Corvette owner will attest. Even the Volt (which is really a hybrid with a backup gas-powered motor) has a core coterie of devoted owners who say the car is reliable and enjoyable, especially when motoring purely on electric power, which costs about one-fourth as much as gasoline. 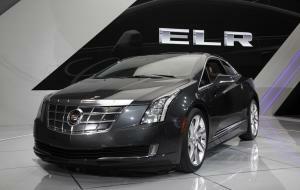 GM will up the ante next year when the Cadillac ELR — a souped-up version of the Volt — debuts, probably in the same price range as the Telsa Model S, which starts at about $64,000. GM’s problem is that its size also works against it. With four divisions producing vehicles in every price range and category, GM tries to be everything to everybody. It also has a bureaucratic culture that some critics say survived GM's 2009 bankruptcy reorganization, even though a succession of CEOs pledged to stamp out the mediocrity propagated by hidebound GM lifers. That’s why GM sometimes turns out meh-mobiles such as the Chevy Malibu, recently “relaunched” after a 2012 upgrade proved underwhelming. GM hasn’t said it’s directly targeting Tesla as a competitor, but it has been closely watching the startup since the beginning. Back in 2006, when the Volt project was percolating in GM labs, vice chairman Bob Lutz (now retired) said reading about Tesla convinced him GM needed to work on something similar. “If some little West Coast outfit can do this, we can no longer stand by,” he said. That little West Coast outfit will soon face other fearsome competitors. Next year BMW will launch its all-electric i3 hatchback, which won’t compete directly with the larger Model S but will clearly serve as a testbed for future BMW electrics. Nissan already builds the Leaf electric, with a range up to 100 miles, and has other electrics planned. Toyota has been a leader in hybrids and now has an all-electric RAV4 (built with some Tesla technology). Volkswagen says it wants to be the world’s biggest electric carmaker by 2018. There’s a place for Tesla amid those giants, especially since it has built a terrific brand and boasts an influential base of devoted fans. Tesla's technology will get better, too, and it has already said it plans to build at least one smaller, cheaper model that will take on more-mainstream competitors. But Tesla still has to make money in a costly, difficult business. At some point, the company’s red-hot glow will fade and it will need to recharge. By the time that happens, there will probably be a fleet of chasers getting larger in the rear-view mirror.